It used to take just 15 minutes to leave the comfort of my parents’ suburban Philadelphia home and drive through the gates of what our local paper once called “the shame of Pennsylvania.” I had not read that story when I first befriended Lizzie at Pennhurst State School and Hospital in the mid-1970s, after my friend's Sunday school teacher arranged for us to visit two longtime residents who never left the facility. Neither had I watched reporter Bill Baldini’s 1968 television series “Suffer the Little Children,” a harrowing exposé that ultimately led to the dilapidated institution’s closure in 1987. In many ways, Lizzie was just like me. She liked to watch "The Beverly Hillbillies.” She liked to have her hair brushed. She loved chocolate. But she couldn’t speak or walk and spent her days in a hospital bed with retractable sides. She couldn’t tell me how she came to live in Pennhurst in 1938 as an 11-year-old, and the attendants didn’t know. They did know, however, that I was her only visitor. Had I seen what Baldini documented—patients shackled to the metal slats on their beds, lying in threadbare gowns on dirty mattresses—I don’t know if I’d have had the courage to set foot in that sad place. I used to flinch to see patients crammed into overcrowded wards, adults in cribs serving as cages, with no sign of personal items and no hope of privacy. But I never witnessed the worst of the atrocities Baldini revealed. I was too young to fully grasp what I saw at Pennhurst, but it was clear enough, even to a teenager, that Lizzie and those like her were being warehoused, kept at a safe distance from “normal” people. What is normal—and the shifting definitions of normal over time for practitioners, patients and society—is the subject of a temporary exhibition at the Exploratorium, recently extended through August 2014, called The Changing Face of What Is Normal: Mental Health. The exhibition, a collection of artifacts, video and audio interviews and artworks that came together bit by bit, occupies the museum’s West Gallery, a new space for exploring the nexus between human thought, behavior and social interaction. Its inspiration comes from the Glore Psychiatric Museum in St. Joseph, Missouri, which Exploratorium senior artist Pam Winfrey happened upon during a family visit. The Glore museum, the brainchild of a Missouri Department of Mental Health employee and historian named George Glore, displays authentic treatment devices from the 1940s and '50s along with replicas of somewhat frightening contraptions from centuries past, many occupied by mannequins. When Winfrey saw a mannequin in a Utica Crib—a 19th-century coffin-like restraint device—the veteran museum curator saw an opportunity. 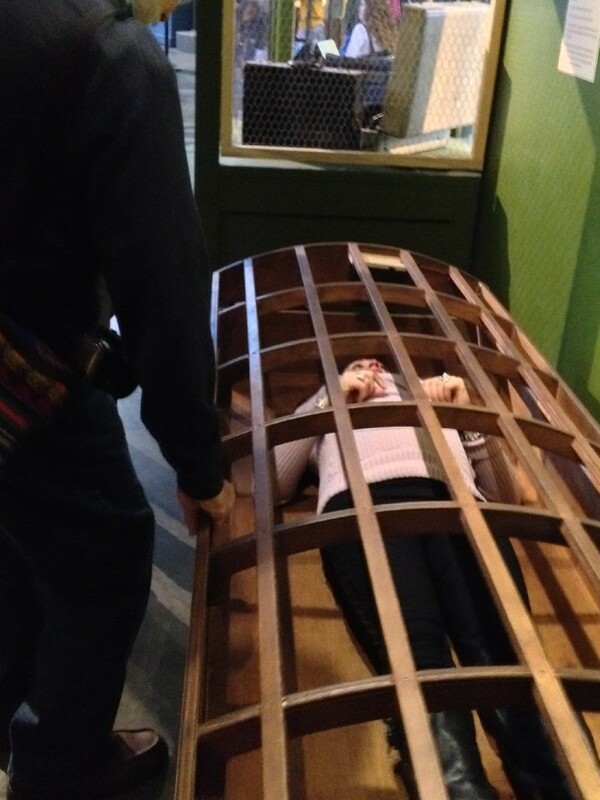 Maybe an interactive exhibit could help visitors imagine what it would be like to be confined in something like that, she thought. She asked exhibit developer Pete Scheidl to make a Utica Crib, and they placed it on the museum floor. But to be truly successful, the crib requires a difficult leap of the imagination, Winfrey acknowledges, especially in a space that can sometimes feel chaotic. “I knew you could never really replicate what it must feel like to be in something like that against your will,” she says. Winfrey contemplated other ways to encourage visitors to think about what it means to be normal--and about what happens when others make that judgment for you. The more she thought about the Glore mannequins locked in grim repose in Utica Cribs, the more she wondered about the people they represent. What were their lives like? Were they really so different from their contemporaries? Would we see them as normal today? What will future generations think of those we consider mentally ill today? These questions naturally led Winfrey to the clinician’s guide to mental conditions, the Diagnostic and Statistical Manual of Mental Disorders, or DSM, published by the American Psychiatric Association. The current edition, DSM-5, sits on display behind a glass case along with its earlier major revisions, testifying to the evolving nature of practitioners’ understanding of mental disorders. Social psychologist Hugh McDonald, senior science writer and project director for the exhibition, says the DSM aims to provide those on the front lines of mental health care with a common language. “At least we can say we're talking about the same set of symptoms." But controversy surrounded DSM-5 even before it came out last May, from charges of conflicts of interest—a 2012 PLOS Medicine study found that three-quarters of DSM advisors have financial ties to pharmaceutical companies that make medications used to treat mental disorders—to “medicalizing” grief and other normal responses to life’s challenges. And just a few weeks before the APA released its manual, National Institute of Mental Health Director Thomas Insel announced that the institute would no longer support research based on DSM categories because they lack “validity”—that is, the diagnoses are based on a collection of symptoms rather than any objective measure. Coinciding with the release of DSM-5, NIMH launched its own initiative, the Research Domain Criteria, to bring the treatment of mental disorders in line with advances in genetics, imaging, cognitive and neuroscience research. The goal is to transform diagnosis and treatment by incorporating objective measures of brain function into a practice that has long depended on the subjective assessment of symptoms. Rather than settle questions about controversies of diagnosis or treatment past or present, the exhibition provides multiple perspectives, leaving viewers to come to their own conclusions. Video monitors offer testimony from patients and practitioners, noting modern-day successes as well as failures. Despite the controversy surrounding the DSM, Winfrey and McDonald recognized its value as a symbol of the changing definitions of normal behavior. But what ultimately challenges you to ponder your own conceptions of what’s normal, and if you spend the time, breaks your heart, comes from a remarkable find: 427 suitcases, long forgotten in the attic of the Willard Psychiatric Hospital, unearthed when the upstate New York institution closed its doors in 1995. Unsure what to do with the suitcases, some set aside when patients checked in more than a century ago, Willard staff called on Craig Williams, a historian with the New York State Museum. Williams’ boss told him to take 10 suitcases. He took them all. Winfrey wasn’t sure whether the suitcases would work in the Exploratorium, until she visited Miller and spent time alone with all the artifacts. 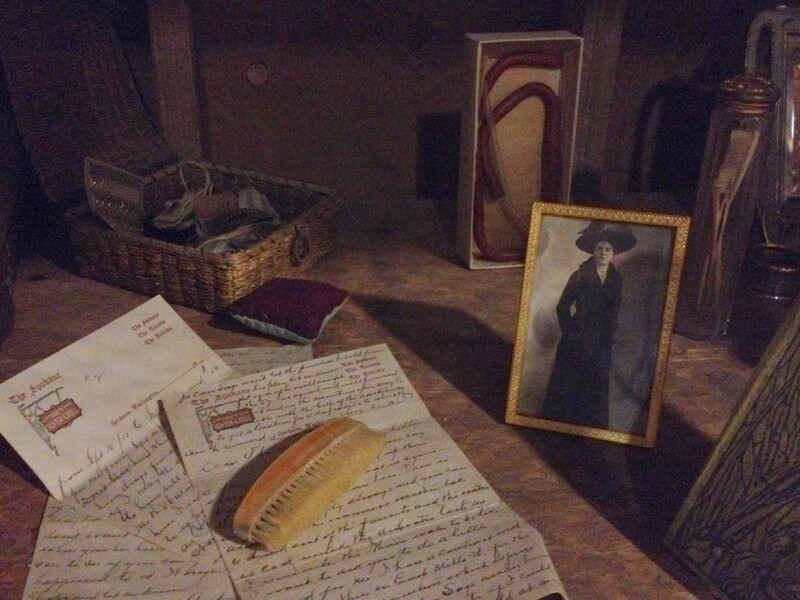 She was struck by the mundane nature of the items--shoes, purses, brushes, letters. They could have belonged to anyone. How better to bridge the gap between those who by whatever stroke of biology or circumstance struggle with mental illness and those who do not? The suitcases now sit behind wire screens, filled with the personal belongings of people who lived decades ago, reaching across the years to tell their stories. “I was hoping that people would look at these objects and understand that there is not a great divide between people who have mental health issues and people who don't,” Winfrey says. 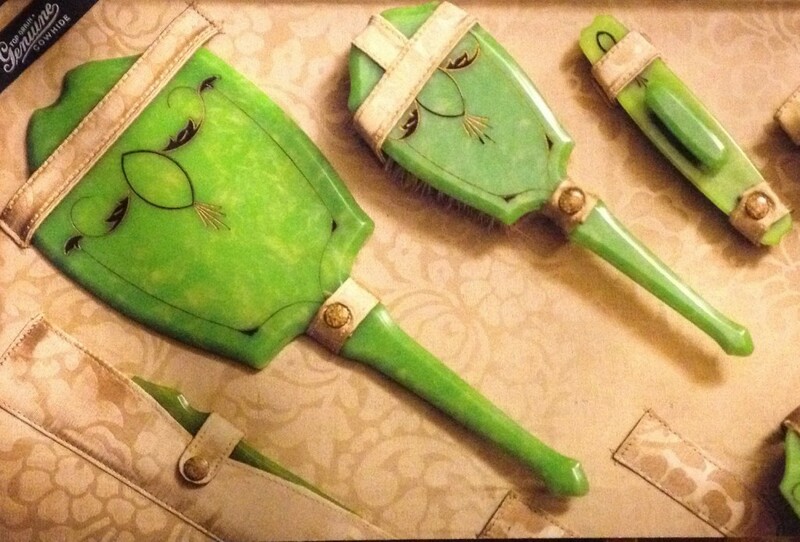 Photographer Jon Crispin took this photo of a Willard patient's brushes, found in one of the recovered suitcases. "These aren’t just things," Crispin says. "They’re a part of people’s lives. There’s a reverence I feel toward these objects that I hope to be able to show in the photographs that I take." Personal stories about each patient accompany their belongings, along with a “then and now” diagnosis, thanks to the efforts of clinical psychiatrist and exhibition collaborator Karen Miller, who secured unprecedented access to the patients’ files, normally sealed in perpetuity to protect privacy. Many of the patients were diagnosed with dementia praecox, a chronic psychotic disorder that was later recast as schizophrenia—including “Frank,” a man whose only “problem” appeared to be that he was homosexual. He was deeply troubled, his records show, but whether his condition resulted from biology or persecution is unclear. It wasn’t until 1973 that the APA removed homosexuality from the DSM. By Winfrey’s account, Willard was a resort compared to Pennhurst. “Willard was a grand experiment, it was almost like a village,” she says. “The only cinema in town was in the hospital, so everybody would go to the cinema there. And before labor laws outlawed it, all the patients would come down to town and work.” In 1973, a federal court ruled that patients in mental health institutions could no longer work for free. Caregivers share their experiences working at Willard through recordings played through phones mounted throughout the exhibition. Some worried that laws designed to protect the patients ultimately deprived them of purpose. The exhibition runs through August 2014. (Winfrey and McDonald discussed their vision for the exhibition last year, before it opened.) Until recently, visitors posted notes about their views of mental health and what's normal on the museum floor, visible on Tumblr. You can join the conversation on Twitter, using the hash tag #myNormal.